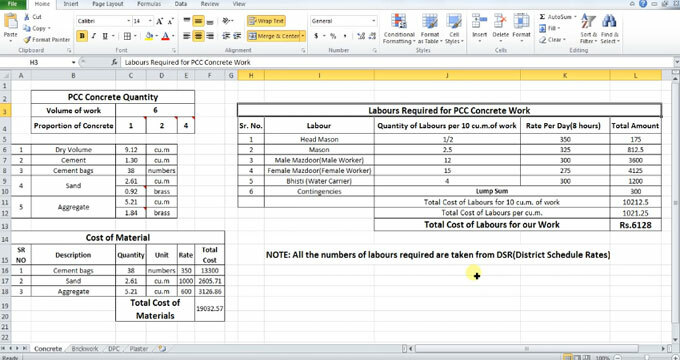 In this construction video tutorial, detailed process is given for calculating the numbers of labors in excel sheet that is necessary for accomplishing PCC or concrete work. The number of necessary labors and their rates for PCC or concrete work are derived from a standard DSR Book. Microsoft Excel is considered as the most vital computer software program for workplace. Various business professionals apply Excel to accomplish everyday functional tasks in the workplace. A significant number of employers depend on Excel for decision support. Excel facilitates you to provide all of the data, evaluate it, sort it as per your customized format, and demonstrate the results with color, shading, backgrounds, icons to save huge times for locating the necessary information perfectly later on. The capacity of excel based spreadsheets is up to a million rows by 16,000 columns that facilitates the users to import and work with enormous amounts of data and attain rapid calculation performance. From the construction point of view, various owners use Microsoft Excel to develop a multi-sheet Excel workbook for tracking the budget, budget changes, commitments, change orders, and actual spendings. Besides, more sheets can be included in the workbook to deal with RFI’s, issues and other items that may influence cost.